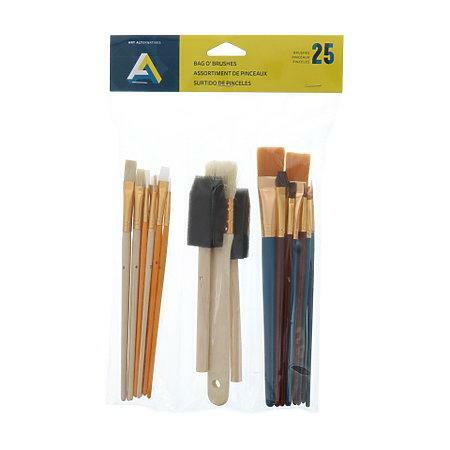 This 25 brush assortment features a wide range of choices in filament, size and shape to suit practically any art or craft application. Use with oil, acrylic, watercolor, tempera, gouache and more. With brushes this economical they're great for any application where the brush may only be expected to endure a few uses. Set includes: two 1" foam; a 1" chip; six golden nylon (two each washes, shaders and rounds); five white nylon (two shaders, one each liner, round and angular shader); five camel hair (three rounds and 2 washes); two sable rounds; and four bristle brushes (three flats and a round).